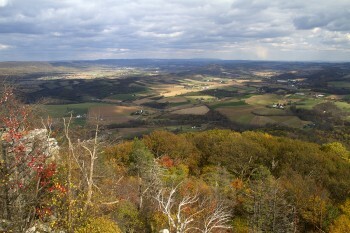 Hike a rocky route with two amazing vistas along the Appalachian Trail in Pennsylvania. Enjoy the expansive view of the surrounding hills, the Kittatinny Mountain ridge in the distance, and the patchwork of farmland in the valley below. Our two cents: While this hike is absolutely a "must-do" on any NJ-area hiker's list, it is popular so it can be crowded due to the incredible views and accessible routes up. We had the chance to do this on a weekday, saw only a handful of people, and managed to have the viewpoints to ourselves on a beautiful fall day. Nice shots - the "biggest cairn" one is great - and I thought the one at Pinwheel Vista was big!